Now that we’ve made Raw Vegan Walnut Taco “Meat”, it’s time to turn it into something delicious! Vegan burritos anyone? This recipe comes together quick! It requires just 8 ingredients and 30 minutes to make. 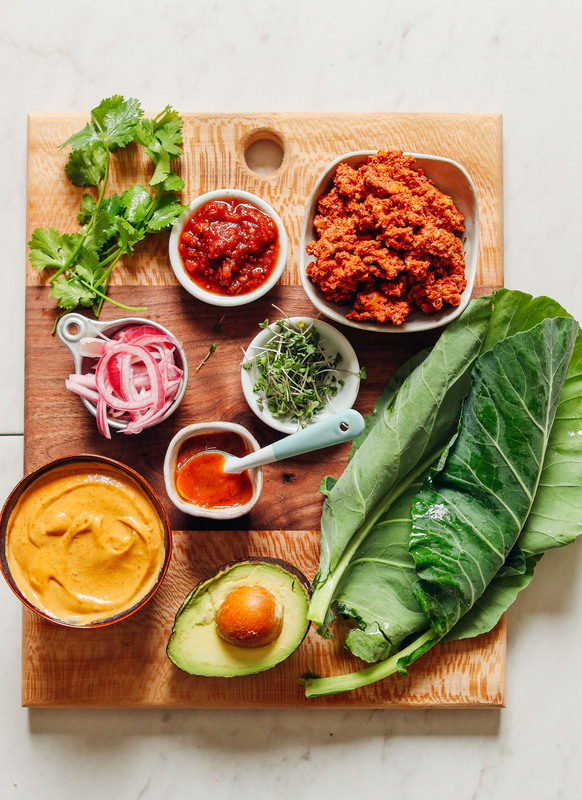 It starts with big, fresh collard greens that have been stuffed with all the tasty things: Walnut Taco Meat, Vegan Mexican Cheese Spread, avocado, cilantro, onion, Red Salsa, and sprouts! Then simply roll it up into a burrito and dig in. Yes, lunch can really be this easy (and delicious). These would make the perfect meal or snack on-the-go. If you can’t access collard greens, you could also make raw tacos with butter or romaine lettuce (like these Rainbow “Raw-maine” Taco Boats). If you’re into fast and tasty Mexican-inspired dishes, be sure to check out these 14 Easy Mexican-Inspired Vegan Recipes! 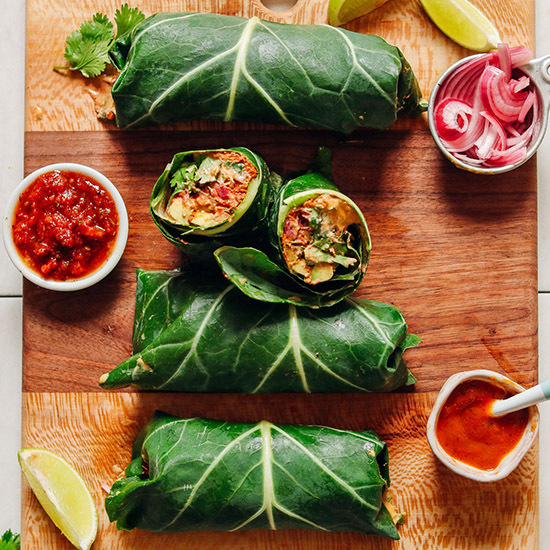 Easy-to-make, 8-ingredient, 30-minute vegan burritos wrapped in collard greens! 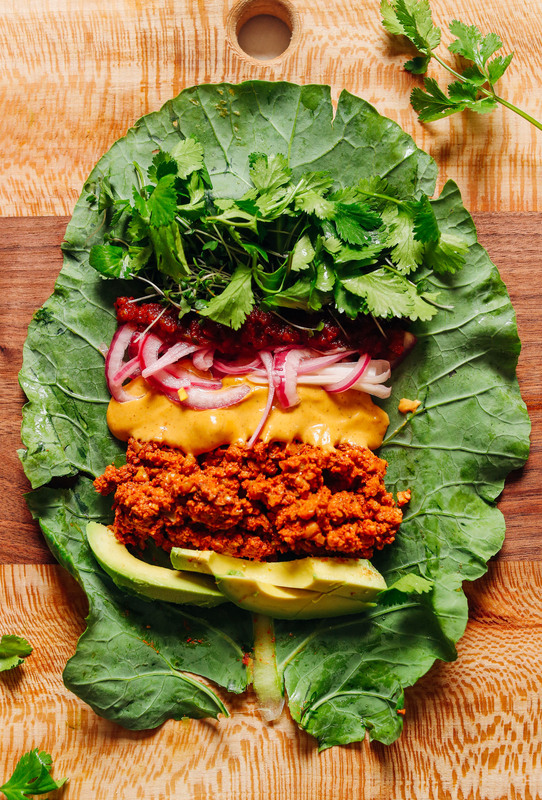 Stuffed with wholesome ingredients like Raw Vegan Taco Meat, Vegan Mexican Cheese, Red Salsa, Avocado and more! The perfect quick and portable lunch or snack. Prepare vegan taco meat and cheese spread if you haven't already. For the cheese spread, we used the recipe for the spread and added a little hot water to thin. Be careful not to get the cheese too thin or it will make for extra-messy burritos. Place washed collard green leaves on a cutting board and cut off the large stems at the base. Then use a knife to thinly shave along the remaining stem at the base of the collard green to thin until pliable (this helps ease the rolling process). Place a collard green leaf on a cutting board and top with 1/2 cup raw taco meat, 1/4 cup sprouts, 1/4 cup cilantro, a couple slices of avocado, pickled onion (or radish), and a few spoonfuls Mexican Cheese Spread and Red Salsa (see photo). Roll one end of collard leaf over the fillings lengthwise. Then fold the ends in, roll again, and place wrap seam-side down on a serving plate. Repeat previous step with the remaining collard leaves and fillings. Best when fresh. Leftovers will keep covered in the refrigerator up to 2 days. *In place of Vegan Taco Meat you can also sub something similar, like Quinoa Taco Meat. *If you can't access collard greens, you could also make raw tacos with butter or romaine lettuce (like these Rainbow "Raw-maine" Taco Boats). *To keep the recipe raw, in the Vegan Mexican Cheese sub the chipotle pepper in adobo for 1 habanero pepper (or omit for less spice). *Prep time includes making the Raw Taco Meat and Mexican Cheese Spread. Will the avacado keep until lunch time inside the wrap if made in the morning for a packed lunch? It might brown a little, but should still be good! For best results, add it right before serving. Hope that helps! This recipe is incredible – Dana never disappoints! I made this for my family on my birthday (instead of going out for dinner, I wanted to make this lol). The recipe was a huge hit with the entire family – including my dad who tends to prefers “meat and potato’s”. This will definitely become a staple meal in our home. It also took, like, 10 minutes to make (followed the recipe as is). I made the Mexican Cheese Spread, which added great flavor and creaminess to the wraps! 10/10! I made Vegan Collard Green Burritos. They were delicious and filling, according to myself and my husband (who is still a meat eater by the way). I used head lettuce and added some tapenade and cucumber slices as well as salsa, avocado, sprouts and vegan cheese sauce. I used a blender for the ‘meat’ sauce and chopped the walnuts by hand so it took a little extra time. Thank you for the recipe. You are so creative and I love your twists! So kind! Glad you enjoyed this recipe, Kel! Made this tonight for me and my husband. Amazing! Can’t believe how well the wrap stayed together. We were able to eat it just like a burrito and we thought the collards were tender enough to eat raw. I subbed the cheese spread for regular shredded cheddar which worked great. Also this made enough for 6 servings, served with a side of Amy’s refried black beans. Thanks for this lovely veggie-centric and low carb burrito alternative! This recipe is ridiculously tasty — even for the most meat-loving creatures. Woot woot! This is music to our ears, Diana! We are so glad you both enjoyed it! This was honestly one of the most delicious dishes I have made since I turned vegan 3 years ago. It was so flavorful and delicious, I will be making it again and again! Yay! Thank you so much for sharing, Val! My collards were not cooperating, probably too small…So I sliced them thin and turned my wrap into a salad. I thinned my cashew queso for a dressing and added kale, shredded carrot and fresh corn. Turned out tasty! Will try as a wrap when I can get larger collard leaves. What a fab idea – keen to try the nut “meat” – I’m always looking for things other than mushrooms or tofu ?. I’m in the U.K. and we don’t really have collard greens (or perhaps they have another name?) so I was thinking of using a large cabbage leaf instead – do you think this would work? Or any other large leaf suggestions? Butter or romaine lettuce will work best in place of collard greens! It is almost impossible to find a keto-friendly vegan recipe. This is awesome for people on the keto diet and want to stay vegan. All we need to do is remove the sugar from the walnut meat and sub the cashews for a lower carb nut or tofu. Thank you, Dana! Hope you enjoy it, Linette! I’m excited to try this!!!!! You’re so creative!! Your blog is amazing and has helped my family transition to a plant-based diet that I am excited about. My kids (11 and 12) love your recipes too! Thank you for all that you create for us. You are pretty-much my go-to blog for all yumminess. Please keep churnin’ out the recipes ’cause we keep eating them! Thanks for the kind words and request! Will add it to the list. Are the collard leaves fresh? Or can you blanch them first before using? 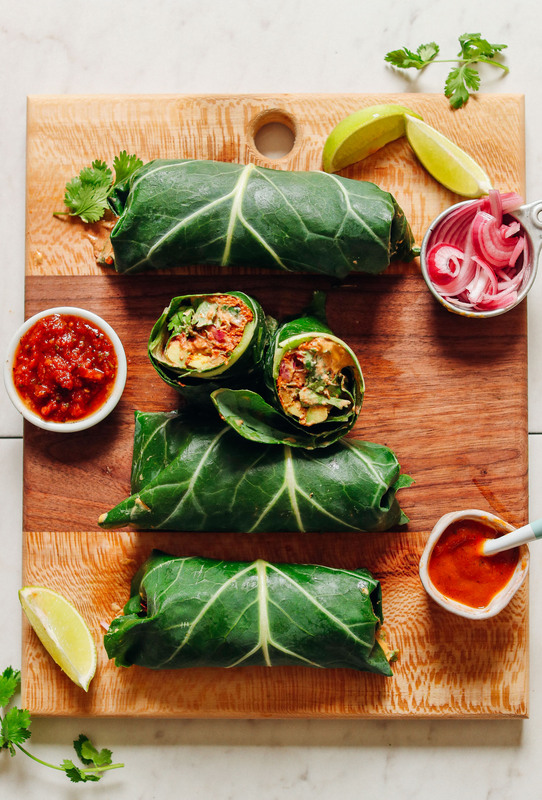 The first time I tried fresh out of the garden collard greens for a wrap I was thrilled at how easy they came together. However when I took a first bite, found the leaves almost too tough to bite through! Since that time I’ve blanched leaves used as wraps. Maybe younger leaves are softer? Hmm, greens shouldn’t be that tough to bite through. However, rainbow chard is usually more tender! Maybe give that a try. Oh the collards can be tough but they can be handled the same way as kale is hanfled when preparing raw vegan recipes. The cell walls need to be broken in most brassica dark greens by either massaging with a sea salt and cold pressed oil or marinading in this mixture for at least one hour. One could run the collards under warm water and then gently massaging in the oil until they are pliable enough to wrap the ingredients into. I love this recipe!! Looks delicious! Love this idea! It is always a little sad when I see “8 ingredients” on Instagram but then click and realize i need closer to 30 to make the walnut taco meat and the Mexican cheese. I know some readers might appreciate a more upfront and realistic tag line! Thanks for the feedback! I like to try and make follow-up recipes that show people how to put our other recipes to use – which in this case is my walnut taco “meat.” Once you have made that recipe, it’s quite easy to throw this burrito together. But I understand how it can be confusing. We’ll keep that in mind in the future! I’ll definitely remember and utilize the leaf wraps, but as soon as I saw the ‘meat’ filling, I lost interest in this recipe. It was a process to transition into a plant centered diet, but I must say, as soon as I stopped trying to replace meat and focused on what I was eating, instead of what I wasn’t, it got a lot easier. For folks who are in that tranaitional place now, I recommend eating well cooked mushrooms and pairing them with garlic and fennel seed and if you can handle it, add some cayenne pepper. I also recommend eating plenty of fat. I tend to go for olive oil, but I try to use a sturdier oil for frying and add the EVOO to dishes that either aren’t cooked, like fresh mixed green salads, or towards the end of cooking when the temperature is low. Tofu can be a great supplement, but I recommend avoiding meat substitutes. They’re mostly just heavy, expensive and unsatisfying. If anything I’m saying doesn’t ring true for other herbivores, I’m always interested to hear about the experiences of others. Blessings. Raw & Vegan cuisine is very special in that it is alive & bursting with enzymes & is a completely clean way to eat. So if ‘meat’ is a regular ingredient in most foods people eat & have eaten for millennia then it makes sense to make faux meats which are delicious, nutritious & reminiscent of a ‘meat’ they may have enjoyed in the past. Anything cooked becomes part & parcel destroyed by the cooking fire & therefore renders the human organism weakened & depleted by consuming it. This recipe sounds delicious & very healing for the bowels. Collards are one of the greatest greens to consume, along with the King, kale, chard, broccoli, spinach & kohlrabi. Thanks for the exceptional recipe! It IS actually a 100% plant-based taco filling. These look delicious but a single serving has 46.3 grams of fat. Whew! That’s a lot for me for a single meal. Can you recommend a lighter option for those of us watching our fat intake? Or would you simply recommend we stay away from this recipe? Hi Sarah. The fat is from nuts and avocado (healthy sources), primarily. You can always leave out the cheese and avocado if you wish. You could also sub some of the walnuts in the “taco meat” for a lower fat nut. 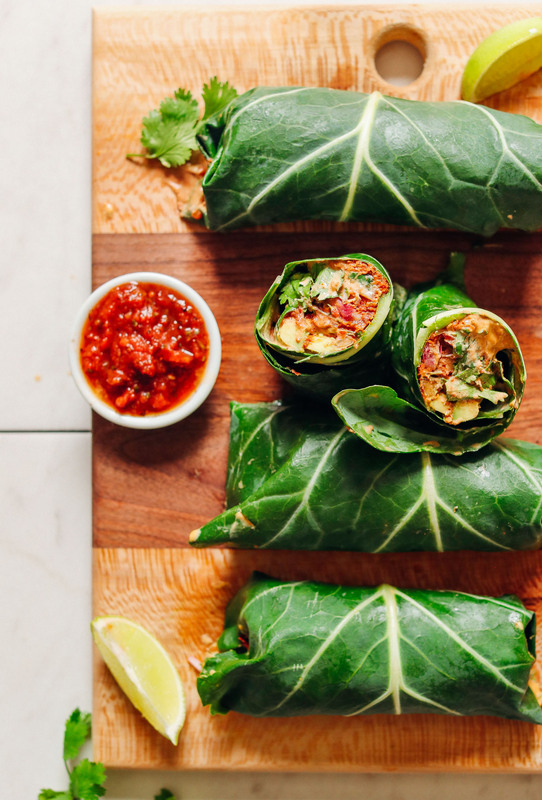 Omg, I can’t believe I’ve never tried collard wraps. These look insane!